Florida Healthcare Services Network nursing agencies are Medicare certified and JACHO accredited providing services in Dade, Broward, Palm Beach, Martin, St. Lucie, Indian River and Okeechobee Counties for over 25 years. Our Network Home Health Agencies promote wellness and expedite rapid recovery for all patients serviced. Florida Healthcare Services Network nurses & patient care teams are licensed and trained professionals. Our staff members perform skill assessments and develop specialized plans of care for each patient in continuity with physicians and other healthcare providers. patients in Dade and Broward counties since 1995.
also relieves the patient’s family of the burden of being a full-time caregiver. a necessity and indispensable to a patient’s complete recovery. 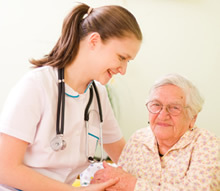 home health care to patients. assessments and conduct extensive orientations to ensure they meet the highest standards in the industry. Health Services…because “Our Heart Is In The Home”. patients in Dade and Broward counties since 1988. Home Health Services...because “Our Heart Is In The Home”.